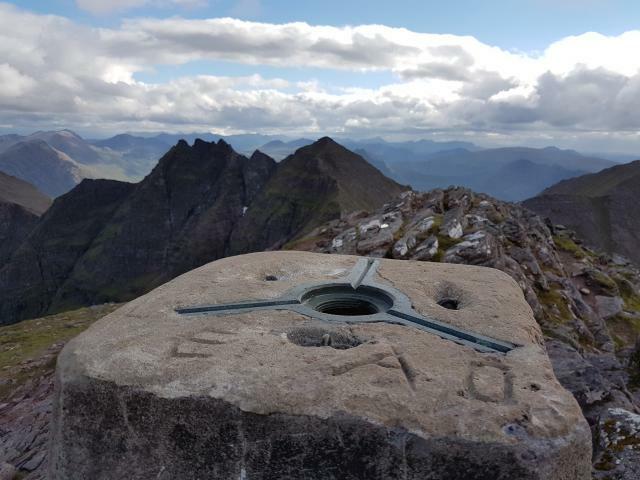 Full clockwise circuit from corrie hallie awesome ridge walking with 2 munros.Trig has a bad crack all the way round breathtaking views here found an ancient benchmark on a rock here. Bright sunny warm day, just about perfect as were the views. 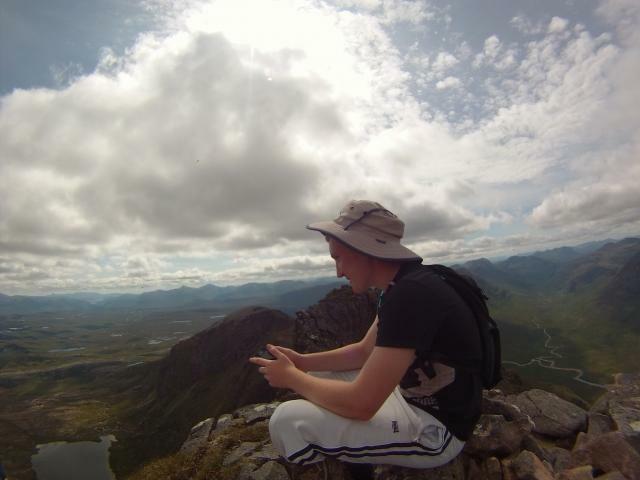 Probably one of the best mountain views in Scotland. 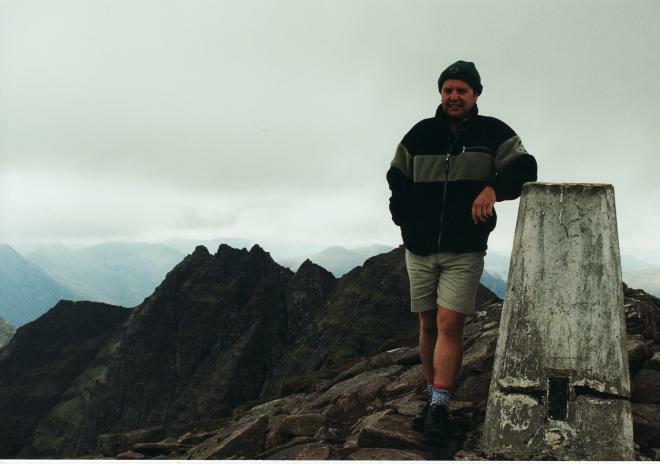 Doing the circuit of An Teallach. Parked near Dundonnell Hotel. 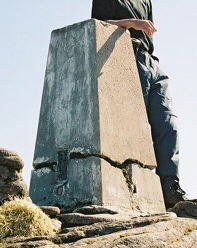 Trig has a substantial crack above ground level all round. cracked/eroded at flush bracket height. An ambition achieved, on a glorious clear day, though quite windy. Two munroes and a cache and a fantastic walk. Me and Connor will never forget this day ! 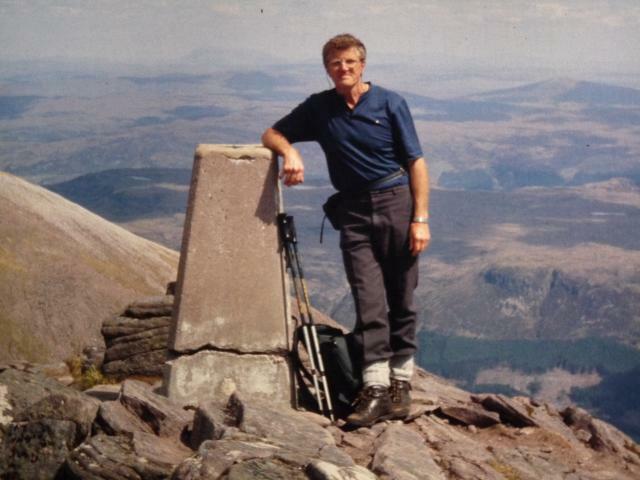 we woke early and drove seven miles from our holiday cottage, we parked at NH 11441 85024 and set off walking at 06:00, our first waypoint was NH 08482 81354 then we turned right off the path and headed for the summit of �Sail Liath� at NH 07164 82476, next waypoint was NH 06892 82580 before descending to NH 06795 82846 at the bottom of the scary ridge ! When we saw the ridge up close me and Connor decided to play it safe and follow the goat path round the side of the ridge but as we sat there a figure appeared over the hill! 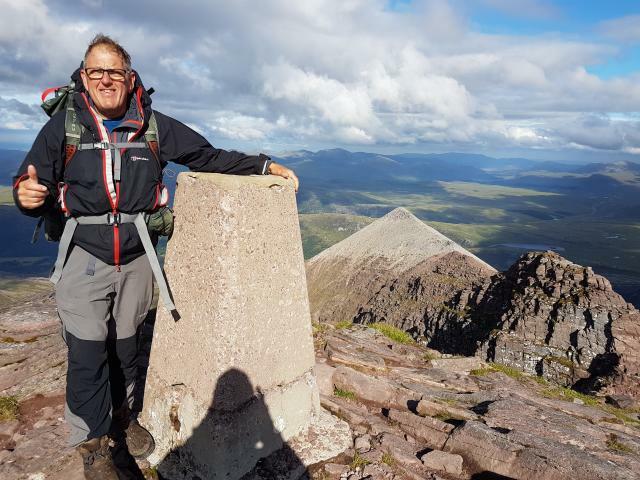 We were very lucky to meet Trevor because he has climbed all of the Munro's and it was his fifth time on An Teallach, things now got very exciting as we traversed the ridge ! here are some waypoints that might help you if you are intending to follow our route ! 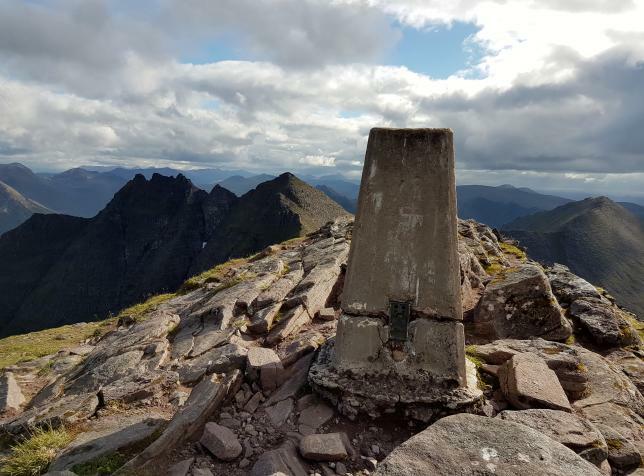 NH 06674 83042, NH 06545 83101, NH 06503 83213, NH 06491 83234, NH 06513 83271 which is �Corrag Bhuidhe� the highest part of the ridge at 3408 ft. Next it was NH 06491 83338 and then NH 06476 83422 which is �Lord Berkeley�s Seat� then back down to NH 06413 83520 which is the end of the ridge and the start of the climb to our first Munro �An Teallach (Sgurr Fiona)� at NH 06410 83666 which is the 73rd highest Munro at 3478 ft, at this point Trevor made sure we were fine to continue on our own then off he went at his own speedy pace, thank you Trevor for sticking with us over the ridge. 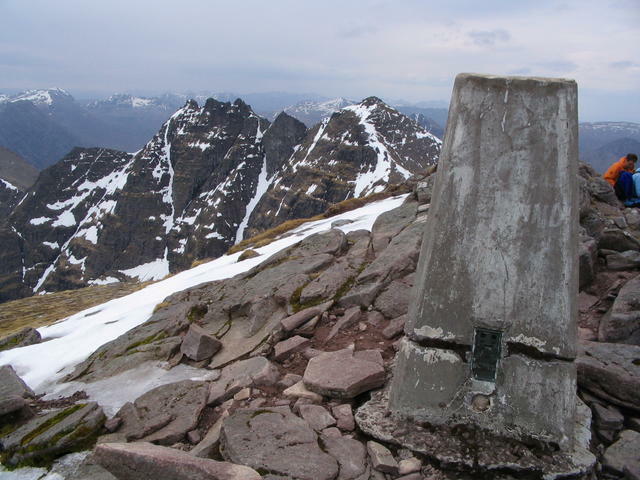 After this its easy enough to bag the trig point on the 72nd highest Munro �An Teallach (Bidein a� Ghlas Thuill)� at 3484ft at NH 06901 84370, From here it was all down hill via NH 07019 84705 then right at NH 06971 84881 to drop down into �Glas Tholl� and follow the water down hill past a couple of waterfalls and eventually coming out onto the A832 at NH 11147 85805, turn right and a bit of road walking back to the car. 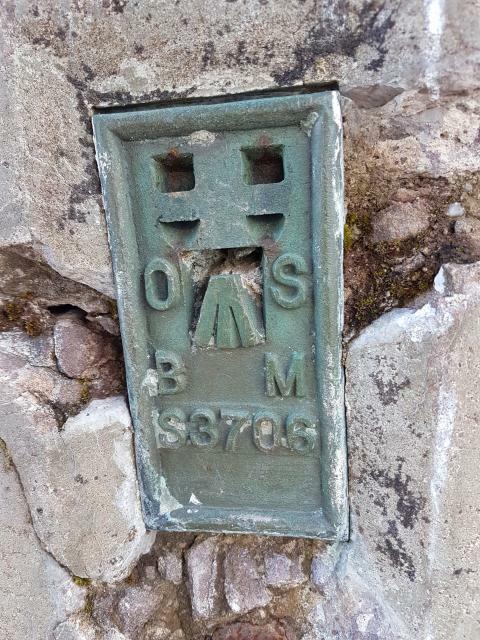 The route was just over ten and a half miles and took us 9 hours 47 minutes, the weather was great, great views and our first ever Munro�s, a day we will never forget. 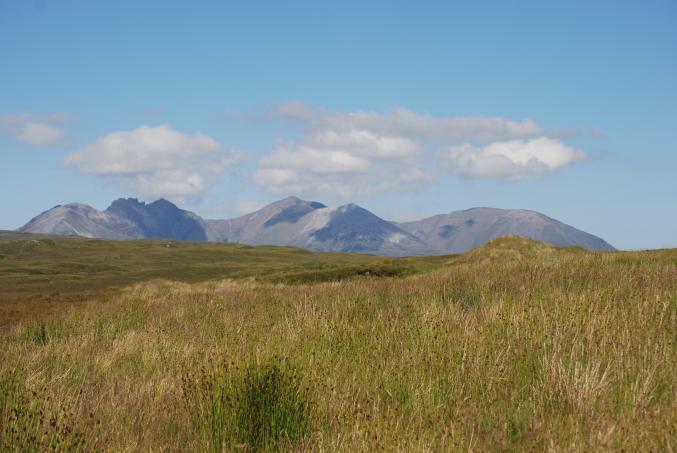 Anteallach You can see the whole of An Teallach in this photo, we walked it left to right, you can see the first summit of �Sail Liath� then the ridge, the first Munro is �An Teallach (Sgurr Fiona)� then we decended before a long climb to the summit of �An Teallach (Bidein a� Ghlas Thuill)� which is the peak in the middle of the photo (this has the trig point on it). Then its all down hill and a right turn to walk down the valley in between the to hills on the right of the photo. The Scary Ridge To the right is the Scary Ridge ! 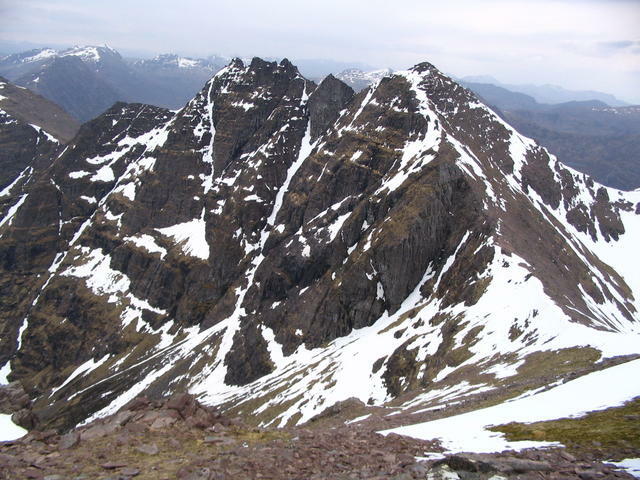 The highest part of the ridge is called �Corrag Bhuidhe� at 3408 ft. 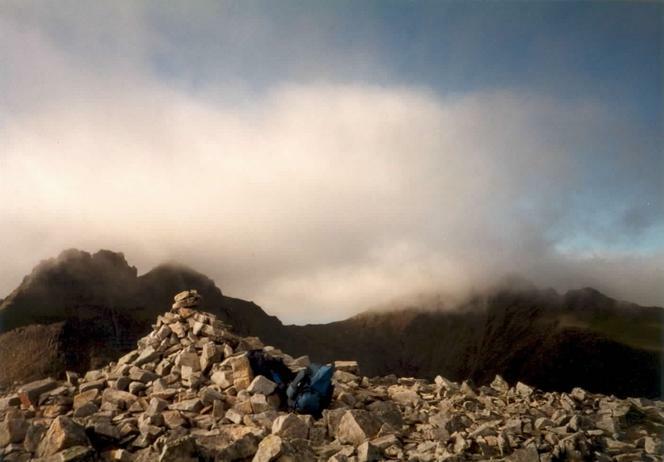 The last part of the ridge, the bit that leans over is called �Lord Berkeley�s Seat� (we had our sandwiches there). 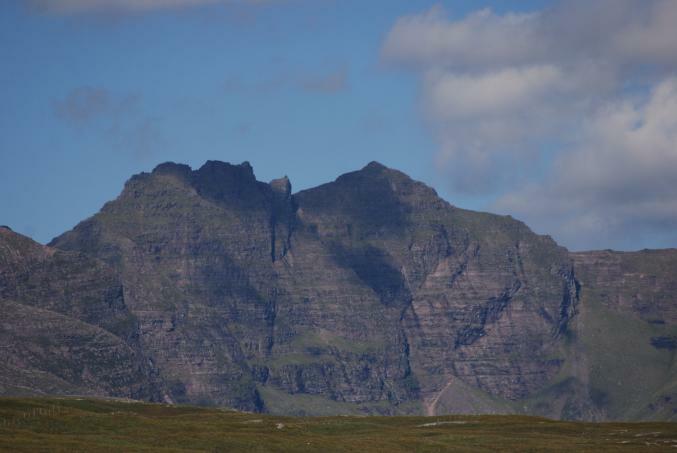 Then the peak on the left is the 73rd highest Munro �An Teallach (Sgurr Fiona)� at 3478 ft.
Connor Connor on �Corrag Bhuidhe� the highest part of the ridge. Triangulation Pillar We made it ! its all down hill from here ! Spent the most miserable night of my life up here on the longest day but terrible weather. Found as the grand finale of a ridge walk taking in a few Munro's. Pillar is quite badly damaged. No view today due to the rain and mist. with Sara Hargreaves across the eastern slopes and up the end of the ridge that eventually leads to Bidean a'Ghlas Thuill. out to the western top back over Sgurr Fiona and then contouring along the steep lower slopes on the north side of pinnacle ridge and down a fully to the lochan along west side and back across to the path from Shenavall out to the road. Large crack all around at FB level otherwise not too bad condition . Spider open,no cap or plug.Part of a long round from Ardessie to include tops & HuMP's to the W finnishing on Sail Mhor. 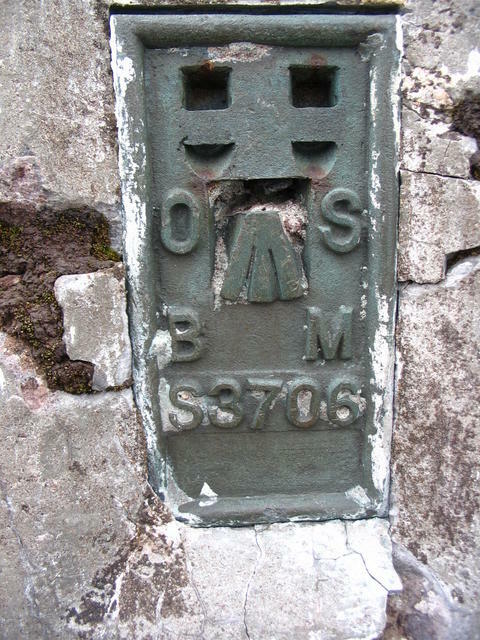 Previously visited this superb Munro,they don't come much better, 28/05/77,23/03/85 & 15/02/87 no trig details noted. Deep crack around pillar at FB height, but FB still in place. No cap or plug. Ring Ouzel on steep N ridge. Had promised myself a revisit on a clear day. 22 years later ... well worth the wait. Superb. Circuit from NW, Ardessie, taking in some lower Tops. Fantastic day - great weather, perfect views, one of the best mainland walks. The sort of day that has you coming back to the highlands year after year. 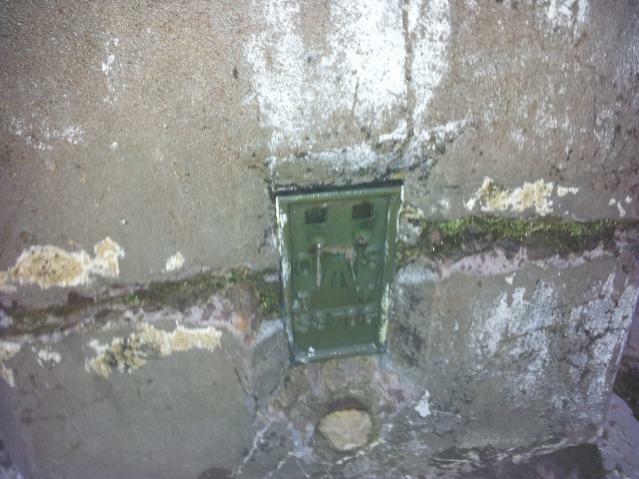 As for the trig - no plug and a very substantial crack across it, which I think merits a 'Damaged' assessment Visited with bowlesy. 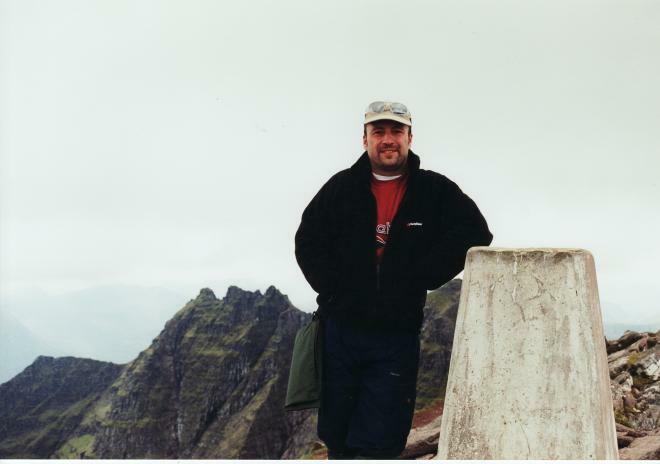 An Teallach was my "most wanted to climb" UK mountain. It was everything I wanted it to be. 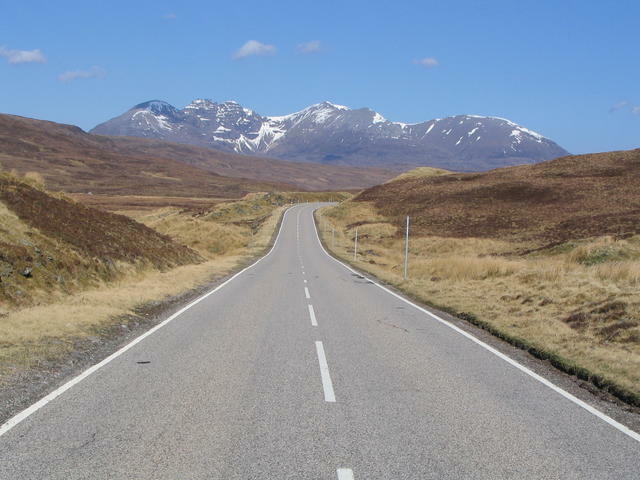 One of my favourite mountains, Parked on A832 at Corrie Hallie. Brilliant day, traversed the ridge from Sail Liath to Glas Mheall Liath. Spectacular views and well worthy of a 10. 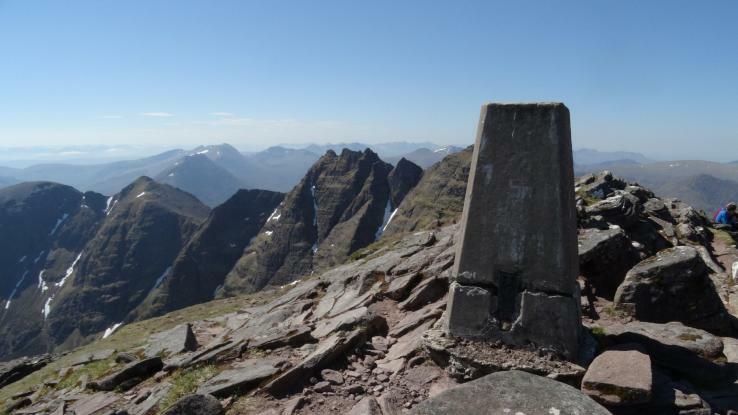 Picked up this trig and the Munro, on the way in to Shenavall bothy for a weekend doing the 'Big Fisherfield 6' on the Saturday. 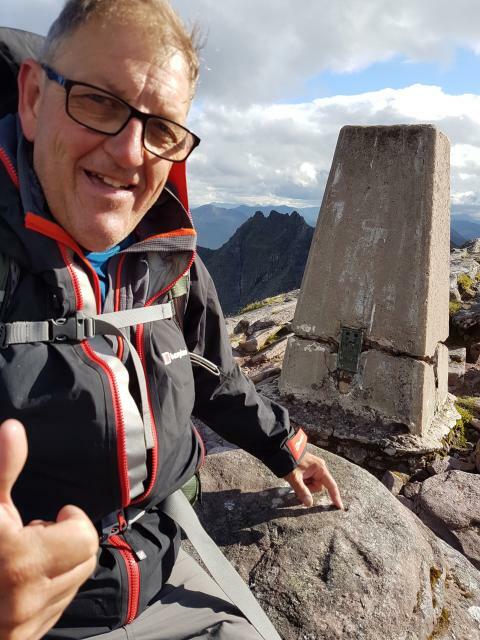 with brother Anthony and Alison Richardson clockwise circuit coming up the southern satellites, Stob Cadha Gobhlach and then the Corrag Bhuide pinnacle ridge and Lord Berkley's seat and Sgurr Fiona, Bidean a'Ghlas Thuill and finally over Sail Liath. Wife's mobile phone rang at the top. Cringe. 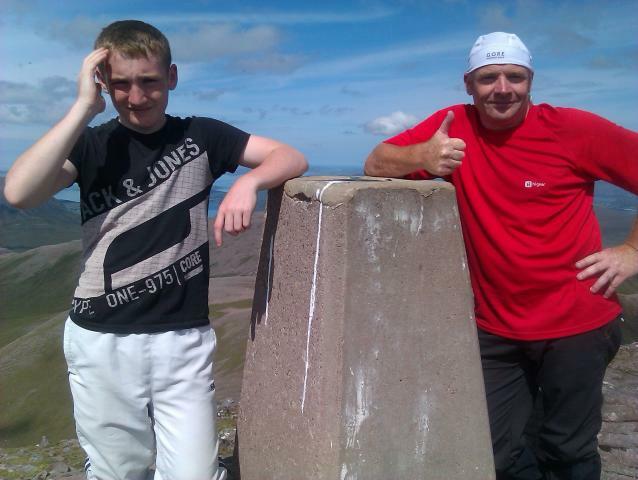 Rating is not for the Trig Point but for this fine mountain. Unfortunately due to poor weather the organised group I was with did not tackle the ridge amd I have always meant to return. Not sure if I have still got the bottle to do the whole ridge now! With Steve Lyon (who wore shorts, and rather regretted it as the weather closed in). Bagged the 2 Munro peaks but as the weather started to deteriorate we decided discretion the better part of valour when it came to traversing the ridge and returned by route of ascent. Stunning walk from Corrie Hallie. 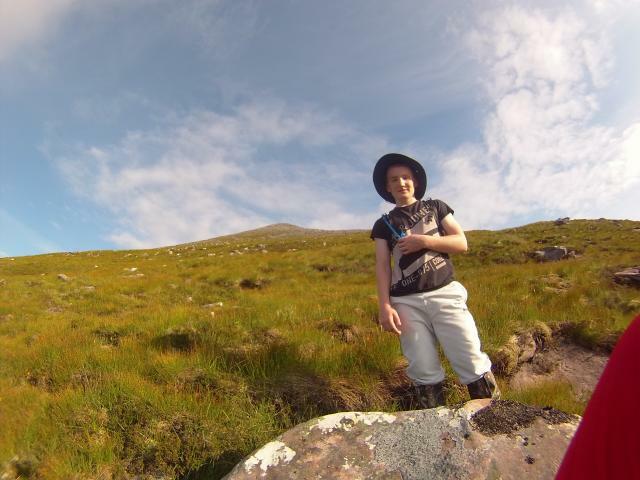 Climbed from Dundonnell this time while on 5 day stay at Sail Mhor Hostel. 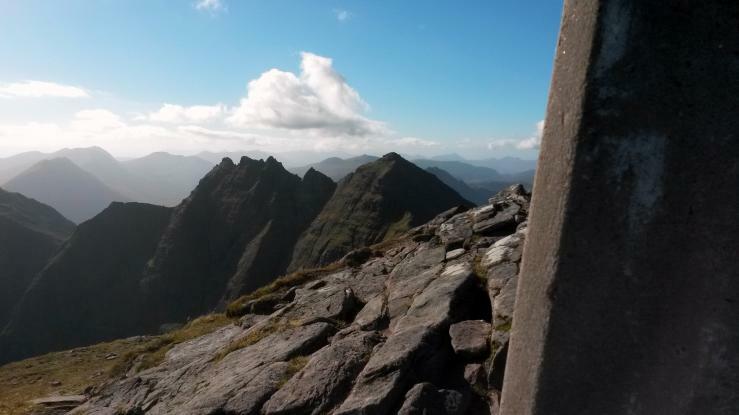 Up doing the An Teallach traverse from Corrie Hallie. Stunning. 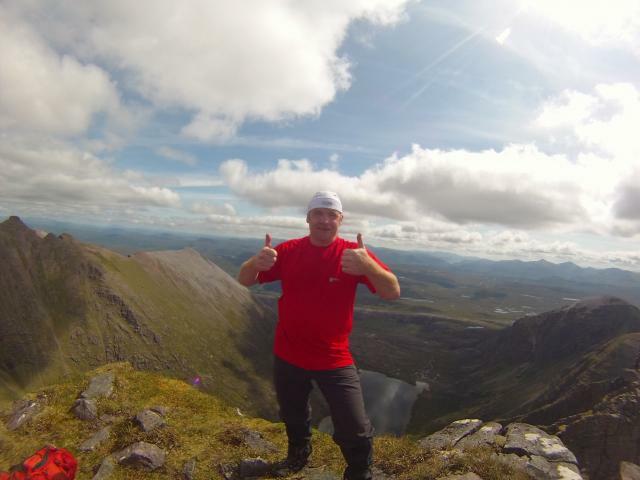 The Corrag Bhuidhe is a must for those with a head for heights. Visited with Nev Cohen and Gerry Akroyd. Lots of snow. Camped near Shenavall with Terry and Iain, warm and windy with 4 load claps of thunder while on summit ridge. 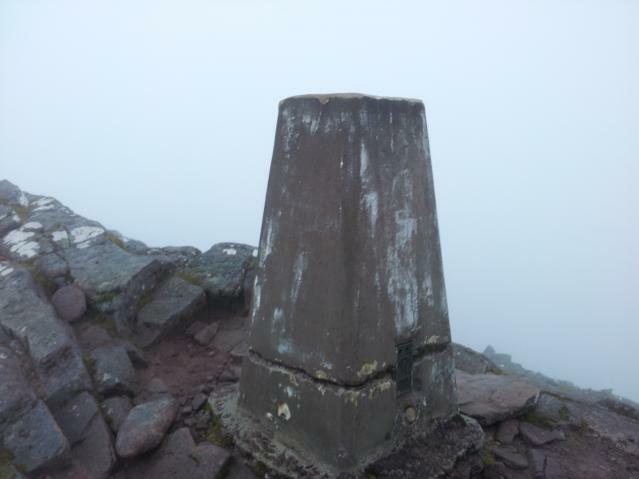 First of a few visits.Have pic of trig before damage to upload..